This Green Smoothie Bowl is fluffy, creamy and smooth and delicious with homemade granola, pumpkin seeds, sunflower seeds and toasted coconut flakes. I love my morning smoothies but sometimes I just feel like adding a little bit of crunch and texture. The texture of this smoothie is thick and creamy, almost like yoghurt. A Smoothie Bowl is a healthy, more nourishing twist on the standard bowl of yoghurt with granola. It’s also the slow version of a regular smoothie and gives you something to chew upon. When you ‘eat’ your Green smoothie and top it with granola and toasted seeds, it becomes a more satisfying meal than when you quickly down a big glass of smoothie in the morning. 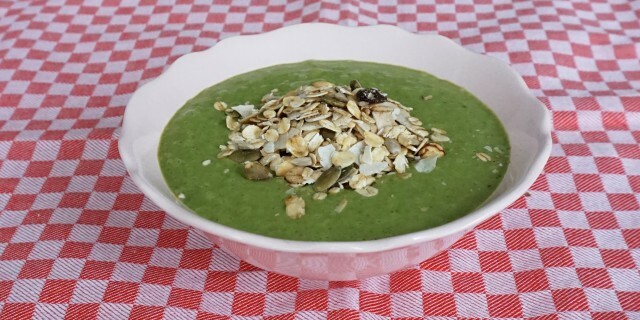 If you like to spice up your breakfast, this Green Smoothie Bowl is a great way to enjoy a nourishing and delicious meal. Toasted pumpkin seeds, sunflower seeds and coconut flakes.